Sadly, I did not dress up for this year’s spooky season. Sadly, I was not feeling heavy in the spirit. But, I saw many out there who were definitely in the Halloween spirit. Here in Seattle, this time was good for going outside in costume. 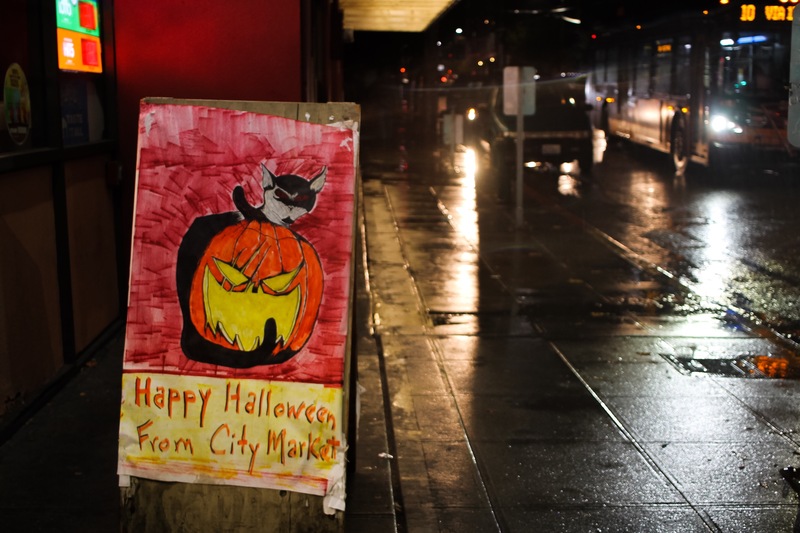 Especially, being that we had no rain on this day, the first in 11 years since the Emerald City streets were wet for Trick or Treaters. An undead cop, with excellent makeup done by Brian Flynn (@aglasscannon on Instagram). Morpheus, at the Goodwill store in Cap Hill. Ask him, and he will offer a choice of the red or blue pill. Choose wisely. A group of jellyfish passing me by. That’s all for now. I enjoyed the spirit of Halloween silliness passing by, and that is enough. Cheers and Happy Halloween! Halloween. This time, a little cold, wet, and quiet. This night on a Monday, with a little misty rain above. The prior weekend held plenty of spooky festivities, so there was plenty time to enjoy live the spirit ahead of the day. Today is good enough for brave and venturous trick or treaters. For all else, the night is best spent indoors, watching a fitting movie of the horror and/or suspense genre.